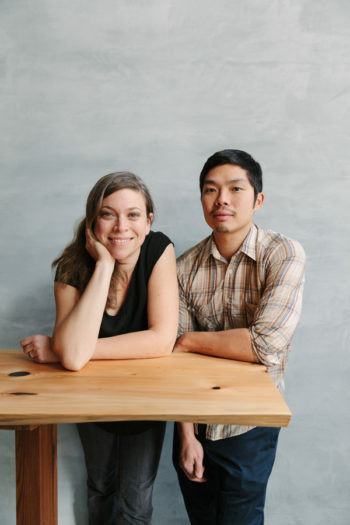 Karen Leibowitz and Anthony Myint. I remember reading about the restaurant before it opened and thinking, “Wow, these people get it. 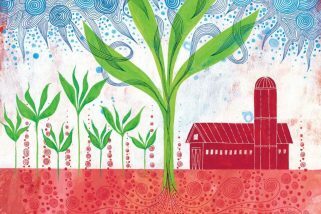 They’ve gone beyond farm-to-table and made the connection between healthy, carbon-rich soil and addressing the climate crisis.” Can you tell us what’s so important about perennials? KL: To be honest, I’d never really thought too much about the difference between annual and perennial [plants] until we compared them in terms of soil. Whereas annual crops get tilled and replanted every year, releasing soil carbon into the atmosphere where it becomes a greenhouse gas, perennial plants send down deep roots that sustain an underground ecosystem that rebuilds soil carbon. And we’re not just talking about preserving large perennials—like trees—from deforestation, but also perennial grasses, which used to cover the prairie states that are now being depleted by annual crops, like wheat. We learned that The Land Institute in Kansas has domesticated a native perennial grass to make a new grain, called Kernza, which restores soil carbon, supports wildlife, and so much more. Grasslands are amazing. AM: The thing that seems to resonate about perennials is that they’re “reforesting” underground.We can’t see the root systems and the corresponding biomass surrounding them, but it can amount to many tons of carbon per acre. The other thing Karen and I didn’t really understand until recently is that’s there is a real difference between soil and dirt. I didn’t realize that soil is alive and dirt is dead. Billions of tiny creatures live in healthy soil and this ecosystem makes our lives possible, but they also make food tastier and richer in nutrients. Healthy soil looks like a dark chocolate cake. It has a crumbly feel and smells delicious. It’s the carbon that gives it that rich color and its fertility. AM: A lot of chefs understand that the best ingredients come from organic farms, and they go to the farmers’ markets to find the tastiest produce, but they don’t usually have time to get into the nitty-gritty conversations about cover cropping and crop rotations. That’s why we’ve been working on the Healthy Soil Guide, a simple resource to help chefs—and home cooks—find the farms with the healthiest soil, which in turn leads to the best-tasting food. We’ve highlighted best practices on farms—such as cover-cropping, composting, crop rotation, and integrating perennials. And most importantly, we’re encouraging farmers to share their soil organic matter data, which is a simple number, to make it really explicit that their soil is actually healthy (compared to the big monoculture farm that’s spraying and plowing and probably would rather not have anyone see how much or how little organic matter is in their soil). We’ve also added sections for ranches and restaurants that champion healthy soil. KL: Chefs don’t need to be experts in regenerative ag, but there’s a ton of overlap between the goals of chefs, diners, farmers, and even climate activists. So often there are trade-offs in life, but building soil organic matter really feels like the place where all these values line up. There’s so much potential if we can come together, but we need a way to communicate. That’s why we’re highlighting soil organic matter as a simple, concrete way to conceive of the issue. The Center for Food Safety premieres its new “Chefs for Soil” film today; watch it below.